Registry for pure bred dogs in the United States. Links to parent clubs for all breeds. Source to all AKC events. Parent club for the Beauceron in the United States. Informative site for all dogs recognized in France. Unfortunately it’s all in French. French site for Beaucerons. Again, only in French. Free language translator. Translation is not literal but it helps. 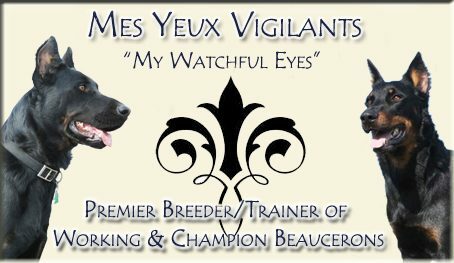 Extensive database of Beaucerons, pedigrees, history, and other information. Database by breed for many inheritable structural defects. Database of dogs tested for eye defects. Home of Cyrano and Sonata. Dog show superintendent for most of the Midwest shows and many on the West coast. Dog show superintendent for most of the East and Southeast shows. Also has some on the West Coast.